ZONING HEARING is TBD. Could be as early as end of FEBRUARY. Please email your comments, objections now, as we don't know when the Hearing is postponed to!! Do we want this in our front yards? 1/22/2019 It is confirmed that Modus/Verizon WITHDREW application on LEXINGTON AVE for the time being, but continues with PARROTT Dr application. Why is this important to our neighborhood? There are currently no cell phone antenna towers located on telephone poles in the Right of Way of our homes. Currently all equipment is on Co-locations in public locations-water towers, cell phone tower "trees" in public spaces etc. There are existing San Mateo County rules to keep locations of towers in co-locations, but the FCC has recently usurped some of the local authority for installation. If the county planning chooses to approve the current proposal for cell phone towers for Verizon to be placed on any telephone poles, then it opens the flood gates and they MUST allow all the different cell phone companies to ALSO place their cell phone tower equipment on the poles also. That means our homes could have multiple cellphone antennas and equipment "the size of a refrigerator" located just feet from out homes. Obviously that would be extremely detrimental to our property value, as well as dangerous to be so close to constant radiation. Many Mayors and community leaders of cities in California are currently fighting the same fight against placement of 5G towers. Burlingame, Burlingame Hills, Hillsborough, San Jose and 30+ others. Local governments can STILL regulate the PLACEMENT and AESTHETICS of an installation within state and federal limits. So please ask to MOVE the placement. We ask that you please write a letter opposing location. Ask for them to move location to an existing co-location in a public space, such as on a water tower or "tree" or to Tower Road area that is land owned by the county and within a mile of Lexington Ave proposed location. 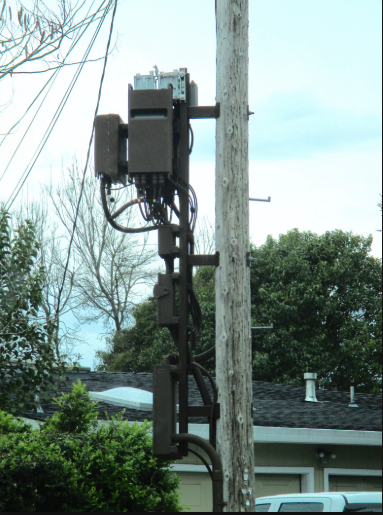 WE all know that we had 4 fires on telephone poles in the summer of 2018, and Parrott Drive has had their own telephone pole fires too due to PG&E equipment failure on the poles. No proof has been provided that it will be safe to add more equipment onto the poles that can't sustain the current load. The County planning staff report gives all the reasons why it should not be approved, but they claim that FCC rules usurp county rules, so they essentially throw their hands up. That is not good enough. Even with FCC rules, The County Planning and officials are responsible to protect SM County residents from unsafe proposals. There is not any evidence that the proposed 5G towers are safe for our locations on Lexington and Parrott Dr.
You have every right to be concerned about the safety of our neighborhood, and express those concerns to the County officials that vote on this Proposal. The ZONING HEARING date is now: POSTPONED, date TBD. Please attend and fill in a SPEAKER form to comment. 5G Verizon (MODUS) proposal to install 5G Cell Phone tower antenna equipment on top of Telephone poles (up to 51 feet high!) in Highlands Neighborhood. Unincorporated CSA1, County Service Area One. 11/2/2018, San Mateo County Notice of hearing, sent ONLY to residents within 300 feet of proposal. County reports to have sent notice 10 days before hearing. No notice was sent to Community Associations. Not HCA, not Baywood Park. HCA request for Continuance of hearing due to lack of info of proposal before hearing. Planning posts Staff report on County website only 2 days before the hearing. 11/2018- 1/2019, At&T installs Fiber network in Highlands. 1/22/2019 It is confirmed, Modus/Verizon WITHDREW application on Lexington for the time being, but continues with PARROTT Dr application.